Designing greeting cards for a living may not be something you’d first think of when considering online jobs. You can become a freelance card designer or writer and earn money doing what you love. Several greeting card companies accept submissions from writers, photographers, or artists to help create one-of-a-kind greeting cards. You can make $50 or more per accepted submission from most companies! 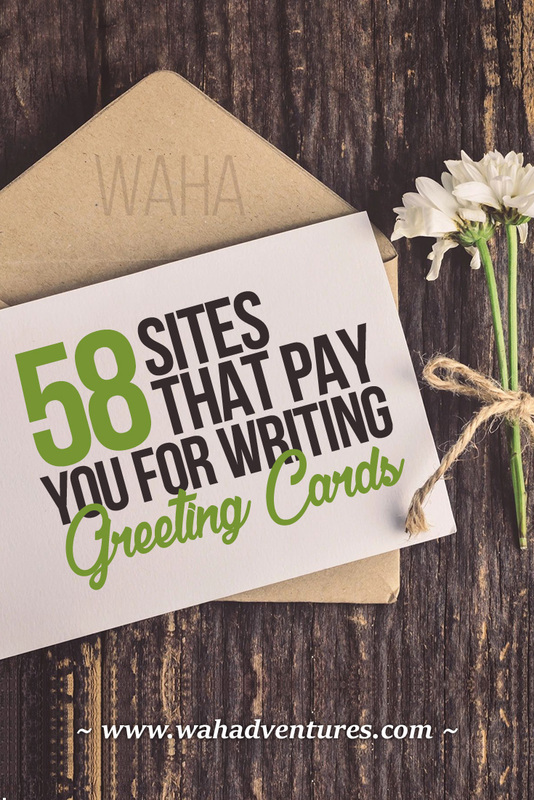 If you’re looking for greeting card writer jobs, try these greeting card companies accepting freelance writers. If they aren’t currently accepting submissions, check back occasionally, or contact the company to find out when submissions may open. Amber Lotus Publishing – Looks for “short and clever” writing submissions for greeting cards. You can submit 3 to 5 samples at a time and will be contacted if any are accepted. American Greetings – You must go through a formal submission process to be accepted as a writer for American Greetings. Their submissions are reviewed monthly. You can also search the company’s Job Opportunities website for more freelance opportunities. Avanti Press – Familiarize yourself with the cards this company sells before submitting some verses for consideration. Blue Mountain Arts (review)– Blue Mountain Arts is a long-running greeting card company. You can request a copy of its writer’s guidelines by e-mail and then submit your writing. Calypso Cards – Calypso Cards reviews writer submissions several times per year, and will contact you if your original ideas are a good fit. Comstock – This company asks that you submit your greeting card copy on 3×5 index cards. It may take about 8 to 10 weeks to get a response. If your work is accepted, you’ll receive $50 per accepted submission. DaySpring – Pays $75 for each accepted submission and is made within 30 to 45 days of acceptance. Gallant Greetings – Gallant Greetings is currently not accepting submissions, but will open submissions on its website as needed. NobleWorksCards – Contact NobleWorksCards via its online contact form for its submission guidelines for greeting card writers. Oatmeal Studios – Oatmeal Studies accepts realistic, funny copy for greeting cards. You can submit ideas via e-mail or snail mail. P.S. Greetings – You can submit your writings to P.S. Greetings via snail mail with a self-addressed, stamped envelope, and the company will let you know if any are accepted. Shoebox – Shoebox accepts writer’s submissions, but doesn’t have a clear spot for it on its website. You can inquire more about writing for Shoebox using the “Ask” feature on the website. Smart Alex – Submit your witty writings via e-mail or snail mail, and Smart Alex will contact you if they’re accepted. Snafu Designs – Snafu Designs looks for humorous writings for its cards. You can submit up to 12 ideas at a time, and should wait at least 8 weeks to find out if they’re accepted. Pays $100 per accepted submission. The Great British Card Company – Submit your greeting card copy, and the company will respond to all submissions within 8 weeks. UK Greetings – UK Greetings looks for “meaningful and authentic” writing submissions for its cards. Send your ideas to the editorial team via its online form. Viabella – Viabella has submission periods, based on holidays and special occasions. Once you submit your ideas, the company asks that you wait about 3 to 6 weeks after the end of the submission period to find out if your ideas have been accepted. Warner Press – Warner Press accepts writings with Christian, inspiring, and uplifting themes for its boxed greeting cards. Pays $35 per acceptance. These greeting card publishers looking for artists and photographers will pay you for accepted submissions. It may help to have a freelance card designer portfolio that showcases your work to send to the company with your submissions. Check back occasionally if they aren’t currently open for submissions. Abacus – Abacus accepts illustrations and photographs for its cards, by snail mail and e-mail. Abbey Press – Abbey Press is not currently accepting unsolicited designs, but you can contact the company to find out when submissions may open up. Allport Editions – Accepts artful, humorous designs and art related to specific cities or states. Allow 12 to 16 weeks for a response. Amber Lotus Publishing – Accepts original art and photography, mostly between April and July. Submissions outside of this window will take longer to be accepted. American Greetings – You must go through a formal process for your original artwork or photographs to be considered for American Greetings. You may also check its Job Opportunities for freelance position openings. Artists to Watch – Artists to Watch accepts only digital submissions of up to 10 at a time. You must follow the submission calendar listed on its website. Avanti Press – You can submit your photography to Avanti Press for review by a photo editor. If it matches the company’s needs, you’ll be contacted to ensure your photo is still available. Bayview Press – Bayview Press is currently closed for submissions, but you can check back on its website to see when artists’ work is being accepted. Brush Dance – Send Brush Dance a link to your online gallery of artwork or photographs, or e-mail the company some samples, for consideration for use in its cards and calendars. Calypso Cards – You can submit your artwork to Calypso Cards for review via e-mail or snail mail. Card Gnome – Design your own cards to sell on Card Gnome and receive 5% of the price of a card, or 10 cents minimum. Your designs don’t even have to be exclusive to Card Gnome to sell. Caspari – Caspari accepts artwork only, no photographs, via e-mail. You’ll be contacted by the company for more samples, if needed. Comstock – Get paid $50 per accepted artwork for Comstock greeting cards. Allow at least 8 to 10 weeks for a response. Crown Point Graphics – Submit a JPG or PDF of your artwork ideas to Crown Point Graphics. Fotofolio – You can submit up to 40 photograph samples to Fotofolio, and the company will contact you if it’s interested in a partnership for its cards. Galison Mudpuppy – Submit your artwork to Galison Mudpuppy for consideration via e-mail or snail mail. The company will contact you if it has a project that you’ll be a good fit for. Gina B Designs – Gine B Designs accepts artwork submissions with “excellent composition and use of color”. The company reviews submissions throughout the year, and will keep your artwork on file for future use. Great Arrow Graphics – Great Arrow Graphics collaborates with over 100 artists for its card designs. If you’re interested in becoming one of them, check out the company’s deadlines for submissions on the website. The company tries to reply to all submissions within 3 weeks. It Takes Two – If you’re interested in submitting your artwork to It Takes Two, use the contact form on its website for more information about submissions. Leanin Tree – Leanin Tree lists several themed categories on its website in which it needs original artwork. You can submit artwork via e-mail and you’ll hear back within 4 to 8 weeks if your work is a good fit. Madison Park Group – This company looks for unique artwork for its designs. E-mail up to 3 submissions, or mail up to 6 samples. The company will contact you if interested. NobleWorksCards – Contact NobleWorksCards via its online contact form for its submission guidelines for artists and cartoonists. Oatmeal Studios – Oatmeal Studios wants “fresh and fun-looking” artistry for its cards. You can submit via e-mail or snail mail, and payments will be negotiated with each artists, depending on the complexity of the designs. Palm Press Inc – Accepts year-round submissions for photographs in a variety of categories, like holidays, wedding, congratulations, and more. Send submissions via e-mail or snail mail, and you should hear back within 2 to 3 weeks, if accepted. Paper Magic – Accepts portfolio submissions from designers and illustrators for consideration in future greeting cards. Submit via snail mail only. Papyrus – Papyrus accepts portfolio submissions from artists who would like to collaborate with the company for greeting card designs. Accepts submissions via snail mail only. Peaceable Kingdom – This company is a family-owned business focused on cooperative play in children. It creates greeting cards for children and accepts submissions from artists. Submit via the contact form or snail mail, and expect to wait about 4 to 6 weeks for a response. Planet Zoo – Planet Zoo looks for photograph submissions of wildlife in its natural habitat. You can submit up to 10 images via e-mail, and Planet Zoo will contact you if interested in your work. Pomegranate – Submit artwork or photography through e-mail or snail mail, and the company will contact you within 8 weeks if your work is accepted. P.S. Greetings – P.S. Greetings looks for designers, illustrators, and photographers to submit copies of their original works for consideration in future greeting card designs. Must submit via snail mail with a self-addressed, stamped envelope. Recycled Paper Greetings – E-mail Recycled Paper Greetings, or use its online contact form, to inquire about its guidelines for submitting artistry. R.S.V.P. – Accepts color printouts, photographic prints, and digital images from artists and photographers, up to 20 images per person. The company states that the fastest response will be for submissions in February and March, but you can submit year-round via e-mail or snail mail. Shade Tree Greetings – This company accepts black and white or color family photographs taken from 1945 to 1985. You’ll get a $100 gift card per accepted submission, plus 12 free cards with your photo. Acceptance can take between 6 months to 2 years. Smart Alex – Accepts humorous photographs, designs, or illustrations by e-mail or snail mail. Smart Alex will contact you if your designs or photos are accepted. The Great British Card Company – Send your photos or illustrations via snail mail or e-mail, and the company will respond to all submissions within 8 weeks. The Greeting Card Shop – The Greeting Card Shop lets you upload your artistry to cards and sell them yourself! Register as an artist, manage your designs, and receive 12% of the sale of each card, which is typically 24 cents. Tiny Prints – As a designer for Tiny Prints, you can design holiday cards, birth announcements, and more. If interested, you can submit your portfolio via e-mail. UK Greetings – UK Greetings looks for artwork, illustrations, and photos for its greeting cards. You can submit via the online form, using PDF, JPEG, or PNG formats. Up With Paper – Up With Paper says that it’s “always on the lookout for new talent” and “trend-setting designs” for its greeting cards. Submit your portfolio by e-mail to the creative director for consideration. Woodmansterne – Woodmansterne’s Design Team holds a bi-weekly Artists’ Submissions meeting to review all submissions from designers, illustrators, and photographers. Submit your work via snail mail or e-mail, and allow up to one month to be contacted if your work is of interest. It’s a good idea for those looking to make money with greeting cards submissions to keep the Greeting Card Association bookmarked. The website lists all the members within the association, which are greeting card companies who may just be in need of your submissions someday! You can also bookmark the Writer’s Write greeting card section if you’re looking for places that may be open to writer’s submissions. Don’t send artwork or copy unless it’s specifically stated that submissions are welcome, or you’ve received permission from the company. Search for greeting card companies that align to your values and style. If you’re skilled in humorous verse, a more serious, motivational card company may not be for you. Become familiar with each company you’re submitting your work to. You need to have a good idea of what each company markets so you can tailor your work to meet their needs. Follow the company’s guidelines precisely. They exist for a reason, and you’ll have a much better chance getting your work accepted if you show that you take heed of the company’s specifications. Take note of specific deadlines. Some companies set deadlines for submissions for certain holidays or occasions. Put your name, address, phone number, and e-mail address on each submission so the company can easily contact you. Yes! I am a writer. Please send me more information about all the companies requirements.Please also share the money making possibilities they offer. I would love to write greeting cards for your company. Please send me the information that entails what you’re looking for. I am an accomplished artist , music industry Rock Logos , designed all merchandise assoc. . I have 8 original smoking designs for greeting cards . What does your company pay ? I have a friend (of 50+ years) who takes amazing pictures of birds, flowers, fields, sunsets, and animals in natural settings. She lost her husband about a year ago, had to sell her house, and move back to her hometown where she rents a cabin in the woods, and is in need of some kind of income. Being almost 69 years old, and having this great talent, I am encouraging her to submit some of these photos to a company for greeting cards or blank note cards, so I’m trying to get some information on how to submit and which companies will accept submissions of her photography, in what form to submit, etc. . I am also seeking information on having her photography made into note cards that she could sell herself in packs of 8 or 10 cards per set with envelopes, each card with a different photo on it. I would like to email the information to her, as she lives in another city.